In this study, we describe the identification and in vitro functional activity of a novel multiple domain complement regulatory protein discovered based on its homology to short consensus repeat (SCR)-containing proteins of the regulators of complement activation (RCA) gene family. The rat cDNA encodes a predicted 388-kDa protein consisting of 14 N-terminal CUB domains that are separated from each other by a SCR followed by 15 tandem SCR domains, a transmembrane domain, and a short cytoplasmic tail. This protein is the homolog of the human protein of unknown function called the CUB and sushi multiple domains 1 (CSMD1) protein. A cloning strategy that incorporates the two C-terminal CUB-SCR domains and 12 of the tandem SCR repeats was used to produce a soluble rat CSMD1 protein. This protein blocked classical complement pathway activation in a comparable fashion with rat Crry but did not block alternative pathway activation. Analysis of CSMD1 mRNA expression by in situ hybridization and immunolabeling of neurons indicates that the primary sites of synthesis are the developing CNS and epithelial tissues. Of particular significance is the enrichment of CSMD1 in the nerve growth cone, the amoeboid-leading edge of the growing neuron. These results suggest that CSMD1 may be an important regulator of complement activation and inflammation in the developing CNS, and that it may also play a role in the context of growth cone function. The complement system consists of over 30 fluid phase and cell membrane proteins that act independently or in concert to defend against invading pathogens. Foreign substrates activate complement via the classical pathway involving C1 (C1q, C1r, C1s), C4, C2, and C3 or the alternative pathway involving C3, factor B, factor D, and properdin (1, 2). These proteins form C3 convertases, C4bC2a of the classical pathway or C3bBb of the alternative pathway, which cleave C3 to C3b. Bound C3b serves as a covalently attached opsonin that can be cleaved by factor I to generate additional C3 fragments. Opsonization by C3b fragments is required for recognition of pathogens and foreign Ags by appropriate cell types and initiation of cellular processes that remove immune complexes and enhance the humoral immune response. Substrate-bound C3b molecules also serve as focal points for the formation of additional C3 convertases in addition to the C5 convertases, C4bC2aC3b of the classical pathway and C3bBbC3b of the alternative pathway. Once C5 convertases are formed, target organisms can be lysed following cleavage of C5 to C5b and assembly of complement components C6, C7, C8, and C9 to generate the lytic membrane attack complex (3). In addition to a protective role, activation of the complement pathway can also exacerbate inflammatory injury and cause extensive damage to self-tissues. To avoid or reduce inadvertent injury, host cells are protected by complement regulatory molecules present in the fluid phase and on cell membranes that inhibit both classical and alternative pathway activation pathways at several points in the cascade. The largest group of proteins responsible for controlling the actions of complement are encoded by closely linked genes present in a locus on chromosome 1 designated the regulators of complement activation (RCA3; Ref.4). RCA genes encode the soluble regulatory proteins factor H and C4b-binding protein, as well as the membrane-bound proteins decay-accelerating factor, membrane cofactor protein, and murine Crry. Regulation of complement is achieved by dissociation of C3 and C5 convertases or by binding to and inactivating C3b through factor I proteolytic activity. Foreign Ags opsonized with complement allow host inflammatory cells and erythrocytes to bind immune complexes via the cell surface RCA complement receptors, CR1 and CR2 (5). CR1 binds activation fragments of C3, which facilitates the recognition and removal of immune complexes from the circulation and also can serve as a regulatory protein (6, 7, 8). CR1 has limited tissue distribution and is expressed on erythrocytes, phagocytic cells, T and B lymphocytes, and follicular dendritic cells. CR2 binds iC3b/C3d opsonized immune complexes (9) and also serves as a receptor for EBV (10, 11). CR2 is expressed primarily on B lymphocytes and follicular dendritic cells where it serves as a link between the innate and acquired immune systems by enhancing induction of the humoral immune response and the maintenance of immunological memory (12, 13, 14, 15, 16). Despite functional differences, the RCA proteins are homologs of each other, each being composed of a tandem array of the ∼60-aa structural motif designated short consensus repeat (SCR; also known as sushi repeat or complement control module) (4, 17). SCR domains have a multiple β-strand structure held together, in part, by four conserved cysteine (Cys) residues that form disulfide bonds between Cys 1 and Cys 3 and between Cys 2 and Cys 4. Unlike most extracellular proteins that have more than one type of structural domain, each type being defined by a specific consensus sequence, the RCA proteins do not contain any of the other widely occurring module types. Furthermore, no other domain besides the SCR has been identified in proteins with the capacity to regulate complement activation at the C3 and C5 convertase steps. Decay-accelerating factor and membrane cofactor protein are each composed of 4 SCRs, the murine regulator Crry has 5 SCRs, factor H is composed of 20 SCRs, and C4BP contains seven identical subunits each containing 8 SCRs. The most common form of CR1 has 30 SCRs, and CR2 contains 15 or 16 SCRs. We have undertaken a strategy using SCR sequence homologies to identify novel complement receptor and regulatory proteins. We particularly wished to identify SCR-containing proteins with unique activity and expression profiles. In the present study, we describe the identification and in vitro functional activity of a novel multiple domain complement regulator, discovered based on its homology to RCA-like SCR containing proteins, that is the rat homolog of human CUB and sushi multiple domains 1 (CSMD1). In this study, we show that CSMD1 as a recombinant soluble protein blocks classical but not alternative complement pathway activation. Rat CSMD1 is the first complement inhibitor discovered to date with multiple domain structure. In addition, analysis of CSMD1 mRNA expression indicates that the primary site of synthesis is the developing brain and epithelial tissues. Immunolabeling subcellular fractions of fetal brain and neurons in culture revealed that CSMD1 is expressed in the nerve growth cone. These results suggest that CSMD1 may play important roles in controlling complement activation and inflammation at these sites, and that it may be involved in growth cone functions, such as amoeboid motility and cell-cell interactions during development of the CNS. A computer profile that aligns SCR sequences from 25 known SCR-containing proteins of several species was devised. This profile was then used to perform protein vs translated nucleotide database Basic Local Alignment Sequence Tool (tBLASTn) searches against the Amgen neural network of private and public expressed sequence tag (EST) databases to identify cDNA clones encoding novel RCA-like proteins. Using this strategy, a clone from a rat pituitary cDNA library was identified. Full-insert sequencing of this clone revealed the 3′ end of the rat CSMD1 cDNA sequence from nucleotide positions 8778 to 10695. Conceptual translation of this 1918-bp cDNA sequence revealed a predicted open reading frame encoding amino acid positions 2927–3564 followed by the stop codon. RACE using TRIzol extracted total RNA from whole rat brain with appropriate oligonucleotide primers (Table I⇓) and RT-PCR was performed to sequence the remaining 5′ end from nucleotide positions 1 through 8779. Conceptual translation of the entire 10,695-bp open reading frame and calculation of the encoded protein molecular mass was performed using ExPASy proteomics tools (〈http://expasy.org〉). Analysis of the rat protein sequence and domain structure was performed using the pBLAST and CD search algorithms of the National Center for Biotechnology Information (NCBI; 〈http://ncbi.nlm.nih.gov〉). The predicted signal peptide cleavage site and transmembrane domain was determined using the SignalP program (〈http://cbs.dtu.dk/services/SignalP〉) and TMHMM 2.0 (〈http://cbs.dtu.dk/services/TMHMM-2.0〉). Prediction of tyrosine phosphorylation sites within the intracytoplasmic tail was determined using the NetPhos 2.0 program (〈http://cbs.dtu.dk/services/NetPhos〉). A pSecTag2/Hygro plasmid (Invitrogen Life Technologies) encoding the 2 C-terminal CUB-SCR repeats followed by 12 consecutive RCA-like SCRs of rat CSMD1 linked to an myc epitope and 6-histidine tag was constructed to generate a recombinant soluble CSMD1 protein (rsCSMD1). 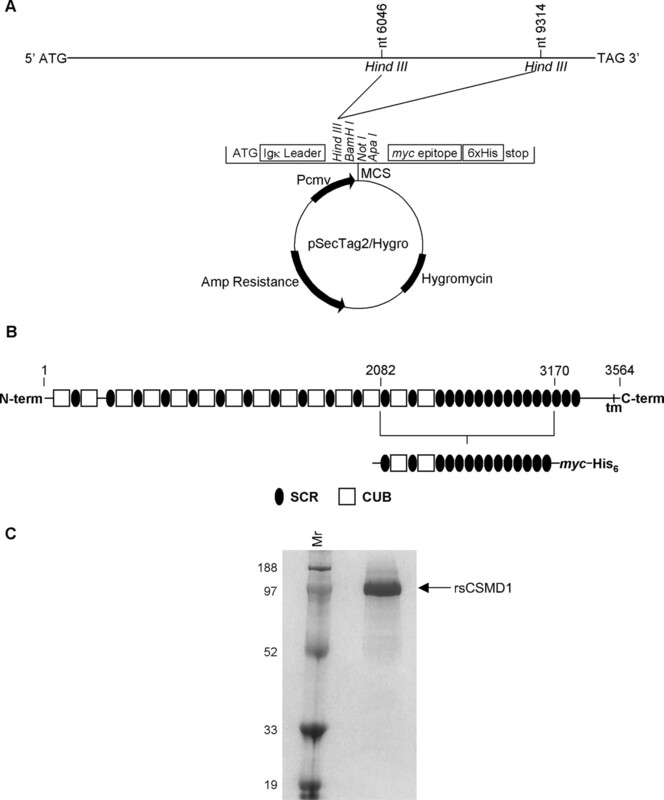 To prepare this construct, a 3268-bp HindIII cDNA fragment encoding the 2 C-terminal CUB-SCR domains and 12 SCR repeats was excised from the original CSMD1-containing plasmid and subcloned in frame with the Igκ leader and myc-his sequences of the pSecTag2/Hygro C vector. Automated nucleotide sequence analysis was performed across the entire rsCSMD1 cDNA insert and cloning junctions to assure the correct result of this construction strategy. 293T cells (Invitrogen Life Technologies) were grown overnight in DMEM and 10% FBS (HyClone Laboratories) with penicillin/streptomycin/glutamine (PSG; Invitrogen Life Technologies) to ∼90% confluence in T175 flasks. The next morning, each flask was changed to Opti-Mem (Invitrogen Life Technologies) medium without antibiotic. Each flask was transfected with 40 μg of plasmid DNA in the presence of 250 μl of lipofectamine (Invitrogen Life Technologies) and incubated for 4 h at 37°C. After 4 h, the media was changed back to DMEM containing 10% FBS/PSG and cells were allowed to recover overnight (∼18 h) at 37°C. The next morning, media was changed to serum-free DMEM/PSG and flasks were returned to 37°C. The media was harvested 48 h later and passed through a 0.22-μm filter before protein purification. Approximately 2 L of conditioned media from transfected 293T cells was concentrated and diafiltered 20-fold into PBS using a pressure cell (Amicon) equipped with a YM30 membrane (Millipore) at 4°C. Sodium chloride was added to 400 mM and imidazole to 12.5 mM before loading onto a 1-ml Ni2+-charged chelating Sepharose Hi Trap column (Amersham Pharmacia) at 0.25 ml/min. The column was washed with 10 vol of PBS containing 12.5 mM imidazole then eluted with PBS containing 250 mM imidazole. The imidazole-eluted protein was loaded onto a 50 × 1.6-cm Superose 6 column (Amersham Pharmacia) equilibrated in and eluted with PBS. Column fractions were analyzed by SDS-PAGE on reduced 4–20% gels, which were stained with Coomassie blue. Fraction pools were made and rerun on a gel that was blotted to nitrocellulose (Schleicher & Scuell) and probed with mouse anti-c-myc (Santa Cruz Biotechnology). The rsCSMD1-containing pool was diluted 3-fold with 20 mM sodium phosphate (pH 7.3) and 1 ml of Blue Sepharose (Amersham Pharmacia) equilibrated in 20 mM sodium phosphate and 100 mM sodium chloride. After overnight mixing at 4°C, the Blue Sepharose was packed into a column and eluted with step gradients of sodium chloride in 20 mM sodium phosphate. Elutions were analyzed once again by SDS-PAGE followed by silver staining. The recovered and highly purified rsCSMD1 fraction was subjected to N-terminal sequencing using a Hewlett-Packard Procise sequencer. Measurement of classical pathway inhibition by rsCSMD1 was performed using a quantitative method that determines C3 deposition on Ab-sensitized human K562 cells (18). For this assay, 106 K562 cells were treated with a K562 cell-specific rabbit polyclonal Ab to form a complement-activating surface. K562 cells and Ab were added to reaction tubes containing 2 mM MgCl2 and 0.15 mM CaCl2 in the presence of 10% Sprague-Dawley rat serum and increasing amounts of rsCSMD1 or soluble rat Crry (gift from Dr. R. Quigg, University of Chicago, Chicago, IL). BSA was added to a separate set of reaction tubes as a negative control. Reaction volumes were brought to 100 μl with PBS and incubated at 37°C for 30 min. Samples were washed twice with cold PBS, 1% BSA, and then incubated 60 min on ice with FITC-conjugated goat anti-rat C3 (Cappel). Cells were then washed in cold PBS, 1% BSA, resuspended in wash buffer, and then analyzed by flow cytometry. Percentage inhibition was calculated using the formula [(1 − (inhibitor sample mean channel fluorescence − background)/(no inhibitor control mean channel fluorescence − background)] × 100. Inhibition of alternative pathway activation was studied using a previously described method that uses flow cytometric analysis of C3 deposition on zymosan A particles (Sigma-Aldrich) (19). Zymosan particles were prepared by boiling 50 mg in 10 ml of 0.15 M NaCl for 60 min, followed by washing in PBS. In each alternative pathway assay condition, 107 zymosan particles were added to reaction tubes containing a final concentration of 10 mM EGTA and 5 mM MgCl2 with increasing amounts of rsCSMD1 or rat Crry. BSA was added to a separate set of reaction tubes as a negative control. Ten microliters of Sprague-Dawley rat serum as a source of complement was added, and all samples were brought to 100 μl with PBS. Following incubation at 37°C for 20 min, samples were washed twice with cold PBS, 1% BSA, and then incubated on ice for 60 min with FITC-conjugated goat anti-rat C3. Samples were then washed in cold PBS, 1% BSA, resuspended in wash buffer, and then analyzed by flow cytometry. Percentage inhibition was calculated using the same equation described above. Inhibition of classical complement pathway hemolytic activity was studied using a standard assay that measures the release of hemoglobin from Ab-sensitized sheep erythrocytes (EA). EA were formed by incubation of sheep erythrocytes with anti-sheep RBC hemolysin (National Jewish Laboratories, Denver, CO) and suspended in GVB++ (Veronal-buffered saline containing 0.15 mM CaCl2, 2 mM MgCl2, and 0.1% gelatin). In each assay condition, 107 EA were added to 100-μl total reaction volumes containing 3% Sprague-Dawley rat serum in GVB++ in the presence of increasing amounts of rsCSMD1 or rat Crry (or BSA as a negative control). Following incubation at 37°C for 30 min, cells were brought to 1.1 ml with PBS and then gently pelleted at 2000 rpm for 5 min. The level of hemolysis in each reaction tube was measured spectrophotometrically at OD412. The molar concentration to obtain 50% hemolysis (CH50) for each inhibitor was calculated by linear regression. Inhibition of alternative complement pathway hemolytic activity was studied using a conventional assay that measures the release of hemoglobin from rabbit erythrocytes when incubated in Mg-EGTA-chelated serum (20). For this assay, 107 erythrocytes were added to 100-μl total reaction volumes containing 3% Sprague-Dawley rat serum in Veronal-buffered saline containing 10 mM EGTA and 2 mM MgCl2 in the presence of increasing amounts of rsCSMD1 or soluble rat Crry (or BSA as a negative control). Following incubation at 37°C for 30 min, cells were brought to 1.1 ml with PBS, pelleted at 2000 rpm for 5 min, and the level of hemolysis in each reaction tube was determined spectrophotometrically at OD412. A panel of normal rat tissues were fixed in 4% paraformaldehyde, embedded in paraffin, and sectioned at 5 μm. Before in situ hybridization, tissues were permeabilized with 0.2 M HCl, followed by digestion with proteinase K and acetylation with triethanolamine and acetic anhydride. Sections were hybridized overnight at 55°C with an 892-bp 33P-labeled antisense RNA probe to the rat CSMD1 sequence or with a sense control probe. The radiolabeled probe was synthesized from a linearized plasmid template by PCR using T3 RNA polymerase and [α-33P]UTP and then purified on a spin column following phenol:chloroform extraction. Following hybridization, sections were subjected to RNase digestion and a series of washes including a high stringency wash in 0.1× SSC at 55°C. Slides were dipped in Kodak NTB2 emulsion, exposed at 4°C for 2–3 wk, developed, and counterstained with H&E. Sections were examined with darkfield and standard illumination to allow simultaneous evaluation of tissue morphology and hybridization signal. Preimmune serum was obtained from ear bleeding a female New Zealand white rabbit (Harlan Sprague Dawley) before immunization. The rabbit was immunized s.c. with 150 μg of purified rsCSMD1 in Imject Alum (Pierce) as an adjuvant. Serum was collected 3 wk later and the rabbit was boosted with 75 μg of rsCSMD1 in adjuvant; s.c. injection of 75 μg of rsCSMD1 was repeated every 3 wk until high titer antiserum was obtained. Rabbit anit-rsCSMD1 polyclonal Abs were obtained by purification over a HiTrap Protein-G column (Amersham Pharmacia) in 20 mM sodium phosphate buffer (pH 7), and eluted with 1 M glycine-HCl (pH 2.5). The resulting eluant was concentrated and dialyzed against PBS (pH 7.4). The elution was analyzed by SDS-PAGE under nonreducing conditions on a NuPAGE 10% Bis-Tris gel (Invitrogen Life Technologies) to assure the purity of the Ab preparation. One Ab band corresponding to 150 kDa was obtained. 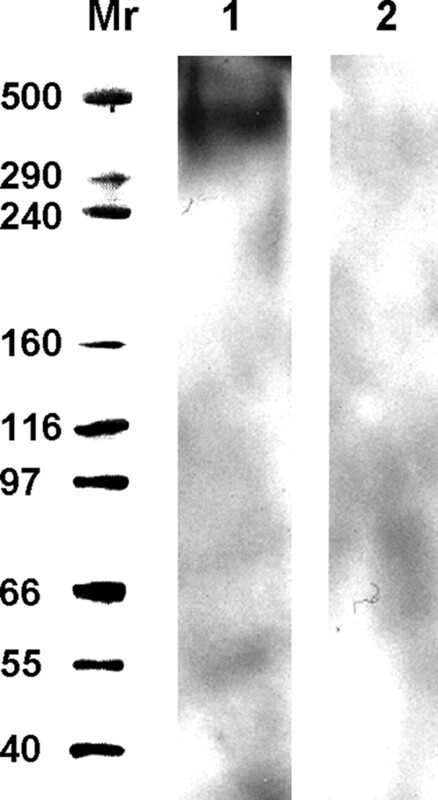 The Ab preparation was tested for specificity against rsCSMD1 by Western blot analysis. Briefly, rsCSMD1 was run on a 10% Bis-Tris gel and transferred to nitrocellulose. The membrane was blotted using the purified polyclonal Ab followed by HRP-conjugated goat anti-rabbit IgG (H+L) and ECL. Neuronal growth cones were prepared from E17 fetal rat brains as described (21). Freshly prepared neuronal growth cone particles were boiled in nonreducing sample buffer and subjected to SDS-PAGE onto a NuPAGE 3–8% Tris-acetate gel (Invitrogen Life Technologies). Proteins were transferred to nitrocellulose and CSMD1 was detected using rabbit anti-rat rsCSMD1 polyclonal Ab followed by HRP-labeled goat anti-rabbit IgG and ECL. Control blots were obtained using the rabbit preimmune serum followed by secondary Ab. Small blocks of cerebral cortical tissue were dissected from E17 fetal rats and cultured on glass coverslips coated with laminin. Twenty-four to 48 hours later, cells were processed for immunofluorescence labeling. Briefly, cultures containing ∼0.75-ml medium were fixed at room temperature by slow infusion of 1 ml of 4% paraformaldehyde in PBS containing 200 mM glucose and 0.4 mM CaCl2 over a 10-min period. Fix was gradually replaced with 4% paraformaldehyde in PBS and cultures blocked subsequently with 1% BSA and 1 mM glycine in PBS. Cells were then permeabilized in blocking buffer containing 0.1% Brij98. Cultures were incubated 1 h at room temperature with rabbit anti-CSMD1 polyclonal Ab followed by Alexa Fluor 594-conjugated goat anti-rabbit IgG and Alexa Fluor 488-conjugated phalloidin (Molecular Probes). After incubation, coverslips were washed in blocking buffer and mounted onto microscope slides. Neurons incubated with preimmune rabbit serum followed by Alexa Fluor 594-labeled goat anti-rabbit IgG were used as a control. Two strategies were used to identify and then determine the full-length cDNA sequence of rat CSMD1. The first used a computational profiling analysis that identifies a cDNA encoding predicted SCR sequences, and the second used RACE by RT-PCR. First, a tBLASTn (protein to nucleotide) sequence homology search strategy that uses SCR sequences from 25 known SCR-containing proteins was devised. This strategy was then used to search the EST databases of GenBank and Amgen to identify ESTs encoding potentially novel complement receptor and regulatory proteins. In searching the EST databases, a clone from a rat pituitary library was identified that contained complement receptor-like SCR structure. Full insert sequencing of this clone and further analysis by 5′ RACE with appropriate oligonucleotide primers (Table I⇑) and RT-PCR was used to obtain cDNA encoding full-length rat CSMD1 (GenBank accession number DQ_124115; 〈www.ncbi.nlm.nih.gov〉). Conceptual translation and analysis of the 10,695-bp open reading frame of the rat CSMD1 transcript suggests that this gene encodes a 3,564-aa protein with a predicted molecular mass of 388 kDa. Alignment of the rat CSMD1 amino acid sequence with that of the published sequences of the mouse (CSMD1; GenBank accession number NP_444401) and human (CSMD1; GenBank accession number NP_150094) orthologs indicate that it is highly conserved from rodents to humans. The rat and mouse orthologs are 98.3% identical to each other while both rodent sequences are ∼91% identical to the human sequence. In agreement with data provided for the mouse form (22), analysis of the rat protein sequence indicates that it consists of 14 N-terminal CUB domains that are separated from each other by a SCR domain followed by 15 tandem SCR domains. Both types of conserved domain are characteristic of secreted and transmembrane proteins. Consistent with this structure, a signal peptide cleavage site is predicted between aa 29 and 30 and a single transmembrane helix is predicted between aa 3487–3509. An intracytoplasmic domain predicted between aa 3510–3564 contains a likely phosphorylation site at tyrosine 3539 suggesting that the CSMD1 protein may be involved in signal transduction mechanisms. Sequence analysis of the 15 tandem C-terminal SCR domains when compared against the NCBI nonredundant protein database indicates that it has the highest homologies to mouse Polydom protein (31% identities, 44% positives) and human complement receptor type 2 (27% identities, 41% positives). Sequence analysis of the entire protein with the conserved domain and Protein Family algorithms of NCBI reveals that CSMD1 shares homologies with many other proteins by virtue of its CUB domains. These include several developmentally regulated proteins (23) such as bone morphogenetic protein, tolloid, neuropilin, and spermadhesins as well as classical complement pathway activation proteases C1r and C1s subunits and mannose-binding lectin-associated serine protease (MASP). Because of the strong homologies of CR and regulatory proteins with the C-terminal 15 SCRs of CSMD1, we sought to determine whether rat CSMD1 exhibits any similar complement-related activities. The large size of the entire cDNA (>10.5 kb) and the generation of the cDNA by 5′ RACE precluded ready expression of the entire recombinant protein. Therefore, we expressed a fragment containing the great majority of the 15 SCRs for in vitro functional analysis in an identical fashion as undergone by other membrane SCR-containing proteins (24, 25). A strategy that incorporates the addition of an myc-epitope and 6 histidine tag to the 2 C-terminal CUB-SCR domains and 12 of the tandem SCR repeats was used to produce a rsCSMD1 protein. This strategy was used for two reasons. The first was to create a recombinant soluble protein containing the complement receptor-like region of rat CSMD1 that could be compared with soluble rat Crry (25) for its ability to inhibit activation of the classical and/or alternative complement pathways in vitro. The second was that recombinant proteins engineered with a histidine tag could be rapidly purified from culture supernatants using a metal chelate column. Fig. 1⇓A illustrates the cloning strategy and vector that was used to generate the rsCSMD1 protein. A HindIII 3268-bp cDNA fragment encoding the 2 C-terminal CUB-SCR domains and 12 SCR repeats was cloned in frame with the Igκ leader and myc-his cDNA sequences of the pSecTag2/Hygro C vector. Fig. 1⇓B shows the predicted structure of the mature myc-his fusion protein encoded by the vector in relationship with the full-length protein. Schematic representation of the rsCSMD1 cloning strategy. A, Diagram showing the 3268-bp HindIII cDNA fragment encoding two C-terminal CUB-SCR repeats and the 12 SCR domains that were cloned into the multiple cloning site (MCS) of the pSecTag 2/Hygro vector. B, Portion of rat CSMD1 that was cloned and the predicted structure of the rsCSMD1 protein encoded by the vector. C, SDS-PAGE of purified rsCSMD1 recombinant protein. Following batch transfection of human 293T cells, rsCSMD1 was purified by FPLC using a Ni2+-chelate column followed by size exclusion chromatography. The predicted molecular mass of the rsCSMD1 protein is ∼124 kDa, similar to that exhibited by the purified recombinant protein (Fig. 1⇑C). The highly purified band near the expected 124 kDa in Fig. 1⇑C was subjected to N-terminal sequence analysis to assure proper signal peptide cleavage of the Igκ leader peptide. The result demonstrated the sequence of RTYEAYELQNCPDPPAF, which is the authentic rsCSMD1 protein with the first four N-terminal amino acids being encoded by the vector. The purified rsCSMD1 protein was compared with soluble rat Crry in the ability to inhibit activation of the rat classical and alternative complement pathways. Regulation of the classical pathway by rsCSMD1 and Crry was compared using a method that measures C3 deposition on K562 cells when incubated in 10% Sprague-Dawley rat serum in a similar fashion as we have used for mouse serum (18). The capacity of a complement inhibitor to regulate complement activation is measured by the percent decrease in the amount of C3 bound to the surface of cells as assessed by flow cytometry. The percentage inhibition of C3 deposition at increasing doses of each inhibitor was compared in parallel as shown in Fig. 2⇓A. BSA was used as a negative control. 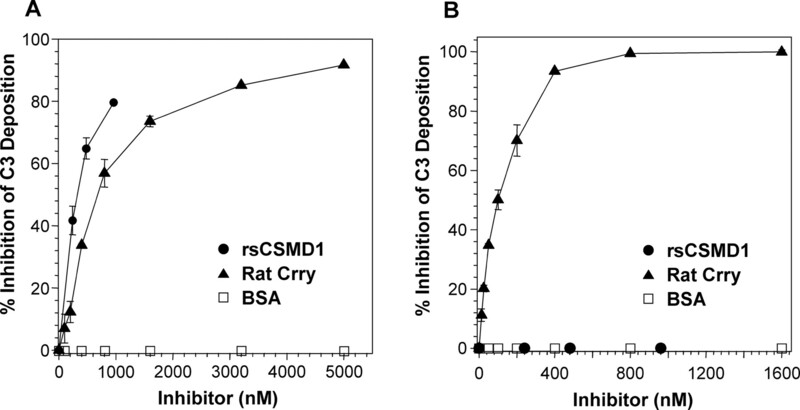 The results clearly demonstrate that rsCSMD1 has complement inhibitory activity. Rat Crry, which contains 5 SCRs, exhibited a capacity at least as potent in inhibiting C3 deposition through the classical pathway suggesting that the 5 SCRs of Crry have a similar specific activity for the classical pathway C3 convertase C4bC2a as rsCSMD1, which contains 12 of its 15 SCRs and 2 CUB-SCR domains. Inhibition of the classical (A) and alternative (B) complement pathways by rat rsCSMD1 protein as compared with rat Crry. A, Capacity of the two proteins to inhibit classical pathway activation was determined by measuring in parallel C3 deposition on K562 cells incubated with 10% Sprague-Dawley rat serum containing K562 cell-specific rabbit polyclonal Ab. Similar results were obtained from two other experiments. B, Inhibition of alternative pathway activation was determined by measuring C3 deposition on zymosan particles incubated with 10% Sprague-Dawley rat serum containing 10 mM EGTA and 5 mM MgCl2. C3 deposition was measured by flow cytometric analysis using a FITC-conjugated goat anti-mouse C3 Ab. Error bars represent SD of the mean. For the alternative pathway we used a previously described method that analyzes the deposition of C3 on zymosan when incubated with 10% Sprague-Dawley rat serum containing Mg2+/EGTA (19). The percentage inhibition of C3 deposition at increasing doses of rsCSMD1 and Crry was compared in parallel as demonstrated in Fig. 2⇑B. BSA was used as a negative control. Strikingly, in contrast to its ability to inhibit classical pathway activation the rsCSMD1 did not inhibit C3 deposition on zymosan through the alternative pathway. The rsCSMD1 protein was also incapable of inhibiting alternative pathway mediated hemolysis of rabbit erythrocytes (20) (data not shown) confirming that rsCSMD1 is not an alternative pathway inhibitor. We wished to confirm that CSMD1 is a novel classical pathway inhibitor using a second assay system. To do so, we chose a more traditional assay that measures the hemolytic activity of complement using Ab-sensitized sheep erythrocytes (EA). For this assay, EA were incubated with 3% Sprague-Dawley rat serum in GVB++ with an increasing concentration of rsCSMD1 or Crry, and the level of hemoglobin release was determined spectrophotometrically. The relative ability of rsCSMD1 to inhibit classical pathway mediated hemolysis of EA with that of rat Crry is shown in Fig. 3⇓. 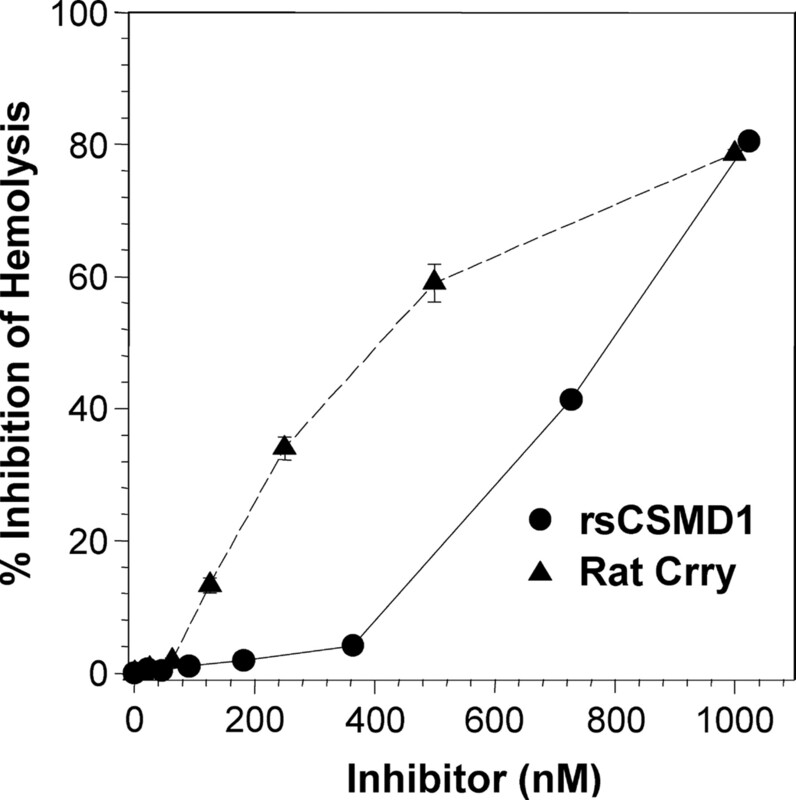 The results confirm that rsCSMD1 has complement inhibitory activity. Comparison of the calculated CH50 (amount to achieve 50% inhibition of lysis) values for rsCSMD1 and soluble Crry are 774 and 409 nM. This suggests that while rsCSMD1 is at least as efficient as Crry at inhibiting C3 deposition via the classical pathway on K562 cells, rsCSMD1 is less efficient than Crry at inhibiting classical pathway mediated hemolysis of EA. Therefore, Crry may possess a higher specific activity than rsCSMD1 for the classical pathway C5 convertase C4bC2aC3b, the enzyme responsible for generating C5b which is the initial step leading to formation of the membrane attack complex. Comparison of inhibition of classical pathway mediated hemolysis with rat rsCSMD1 protein and rat Crry. Capacity of the two proteins to inhibit hemolysis was determined by measuring hemoglobin levels of lysed EA incubated in 3% Sprague-Dawley rat serum. Error bars represent SD of the mean. Similar results were obtained from two other experiments. Tissue-specific expression of the CSMD1 mRNA transcript was examined by in situ hybridization of over 40 different adult rat tissue preparations from all systems of the body (Table II⇓). Sections of adult rat tissues incubated with the antisense strand complementary to CSMD1 mRNA showed the most extensive labeling in neurons of the CNS. The highest overall expression can be visualized in neurons of the hippocampus including all cornu ammonis fields and dentate gyrus as evidenced by densely clustered silver grains (Fig. 4⇓, A and B). In comparison, moderate expression of CSMD1 mRNA can be visualized in neurons of the neocortical layers II-VI and pyriform cortex. In contrast, white matter and fiber tracts of the corpus callosum displayed no signal. Expression of CSMD1 mRNA can also be seen in the bipolar cells of the retina in contrast to photoreceptor cells, which display no signal (Fig. 4⇓, D and E). Signals obtained with the antisense probe reflected the presence of CSMD1 mRNA because control hybridizations performed with a sense probe failed to produce any discernible cellular labeling (Fig. 4⇓, C and F). Expression of CSMD1 mRNA was also seen in the cerebellum, olfactory bulb, spinal cord, thalamus, and brain stem of the adult rat CNS. 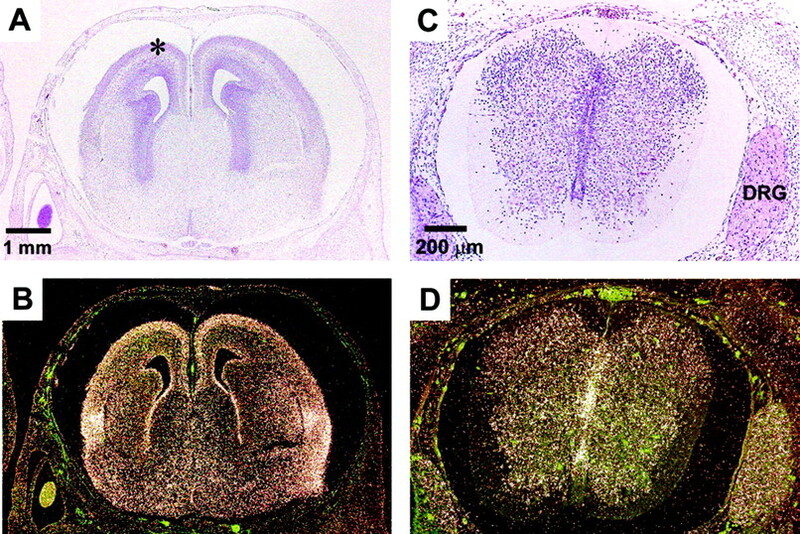 Hybridization of the CSMD1 antisense mRNA probe to tissue sections from thalamus and brain stem at higher magnification verifies that CSMD1 is expressed in neurons as evidenced by clustered black grains in light phase images (Fig. 4⇓, G and H). 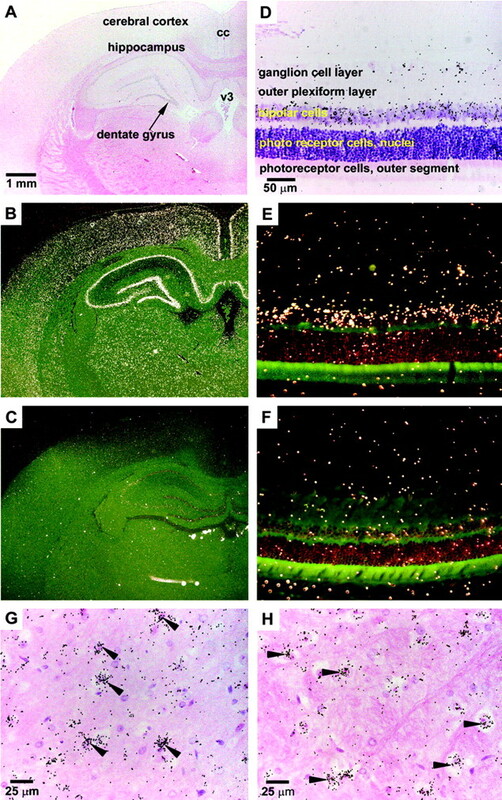 Expression of CSMD1 by mRNA in situ hybridization in adult rat brain and retina. A and B, Autoradiograph of a coronal section of adult rat brain at low magnification shows strong mRNA hybridization signals in neurons of the hippocampus, cerebral cortex, and dentate gyrus (arrow; A). No signal can be seen over the corpus callosum (cc) and fiber tracts. D and E, CSMD1 mRNA hybridization signals are seen in bipolar cells of the retina in contrast to cells of the photoreceptor nuclei which display no signal. Sections were examined with dark field autoradiography (B and E) and standard illumination (A and D) to allow simultaneous evaluation of tissue morphology and hybridization signal. Positive signals for RNA were detected using 33P-labeled antisense cDNA probe complementary to CSMD1 mRNA. C and F, Specificity of the probe was confirmed from dark field images of control tissue sections incubated with 33P-labeled sense cDNA probe. Histological examination of brain slices from the thalamus (G) and brain stem (H) at 40-fold higher magnification demonstrates that CSMD1 mRNA is expressed in cells of neural morphology (arrowheads). Non-neuronal expression was detected at low levels in rat adult epithelial cells of the gastrointestinal system as well as in the kidney, adrenal gland, skin, and spleen (Table II⇑). In contrast, tissues of the cardiopulmonary system did not display any expression of CSMD1 by mRNA in situ hybridization. Examples of epithelial cell expression are shown in Fig. 5⇓ where clustered signals of the antisense probe can be visualized in epithelial cells of the hair follicles (Fig. 5⇓, A and B) and mammary ducts (Fig. 5⇓, C and D). Because CUB domains are found in proteins that are developmentally regulated, we wished to determine whether CSMD1 was also expressed in reproductive organs. As shown in Fig. 5⇓, CSMD1 mRNA expression can be seen in the corpus luteum and follicles of the female reproductive system (Fig. 5⇓, E and F), albeit at low levels, as well as in primary spermatocytes of seminiferous tubules in the male (Fig. 5⇓, G and H). Expression of CSMD1 mRNA by in situ hybridization in adult rat epithelial cells and reproductive organs. A and B, Strong mRNA hybridization signal is present over epithelial cells at the base of hair follicles. C and D, CSMD1 mRNA expression signals are present over mammary epithelium of breast ducts. E and F, Low level mRNA hybridization signals can be seen over granulosa cells of developing follicles and corpus luteum of the female reproductive system. G and H, Primary spermatocytes (arrows) have CSMD1 hybridization signals within seminiferous tubules of the male reproductive system. Although we first identified CSMD1 in a rat pituitary library, the rat pituitary cell line GH3 did not demonstrate positive for CSMD1 mRNA expression by RT-PCR. In addition, we were not able to detect expression of CSMD1 in the pituitary by mRNA in situ hybridization. Thus, CSMD1 does not appear to be expressed in the pituitary, and the initial cloning from the pituitary cell source must have been due to contaminated cells from other neuronal sources. Because of the high level of mRNA expression in the adult rat brain, we wished to determine whether the CSMD1 gene is developmentally regulated in the CNS. 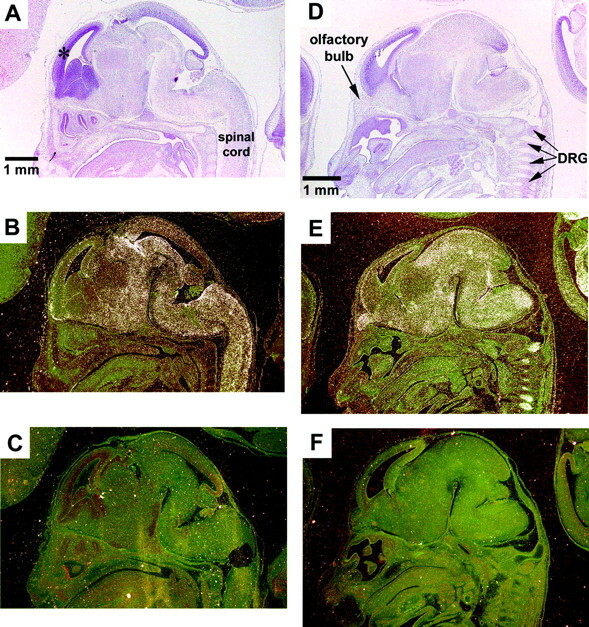 Analysis of the CSMD1 mRNA in a sagittal section of a day 15-mouse embryo shows strong overall expression throughout the developing brain and along the spinal cord (Fig. 6⇓, A and B). However, areas of high cell proliferation (∗ in Fig. 6⇓A), such as the cerebral cortex at this age, exhibit low CSMD1 expression levels. A section taken parasagittally along the spinal cord exhibits mRNA expression that includes the olfactory bulb and dorsal root ganglia (DRG; Fig. 6⇓, D and E). Control hybridizations performed with the sense probe failed to produce any discernible cellular labeling (Fig. 6⇓, C and F). Strong overall expression signals can also be seen in neurons of a coronal section of the developing E17 rat brain (Fig. 7⇓, A and B) and in neurons from a transverse section of the spinal chord and dorsal root ganglia (DRG) (Fig. 7⇓, C and D). CSMD1 expression in the further developed cerebral cortex is substantially increased at this stage when neuronal outgrowth is observed (compare ∗ in Figs. 6⇓, A and B, with 7, A and B). These data indicate that CSMD1 is an important developmentally regulated gene of the CNS. In addition, expression of CSMD1 mRNA in DRG of rat and mouse embryos suggests that this gene is also regulated in neurons of the developing peripheral nervous system. Expression of CSMD1 by mRNA in situ hybridization of embryonic mouse brain. Expression of CSMD1 mRNA in the developing CNS is shown from a sagittal section of an E15 mouse embryo (A and B). Sections taken parasagittally of the E15 mouse embryonic CNS (D and E) shows mRNA expression signals in the DRG and olfactory bulb (arrows). Expression of CSMD1 mRNA is not observed in the cerebral cortex at this stage of development when cells are still dividing (∗; A and B). Positive signals for RNA were detected using 33P-labeled antisense cDNA probe complementary to CSMD1 mRNA. C and F, Specificity of the probe was confirmed from dark field images of control tissue sections incubated with 33P-labeled sense cDNA probe. Expression of CSMD1 by mRNA in situ hybridization of embryonic rat brain. Expression signals for CSMD1 mRNA can also be seen in a coronal section taken from E17 rat brain (A and B). A transverse section through the upper thorax of E17 rat embryonic CNS confirms expression in the developing DRG and neurons of the brain stem (C and D). CSMD1 mRNA is highly expressed in the cerebral cortex at this stage of development during neuronal differentiation and outgrowth (∗; A and B). Because our in situ hybridization data indicated that CSMD1 mRNA is developmentally regulated and highly expressed in the developing brain, we wished to determine whether CSMD1 protein was present in growing neurons. Of particular interest was the question of whether CSMD1 protein was a membrane component of the neuronal growth cone, the amoeboid distal tip of the growing axon. The growth cone functions as a motile-sensing device that guides the growing axon along the proper path to the appropriate target area for synaptogenesis. Brains from E17 rat fetus were removed and growth cone particles purified as described in Materials and Methods. As shown in Fig. 8⇓, Western blot analysis using a polyclonal Ab generated against our rsCSMD1 protein demonstrates that CSMD1 is expressed as an ∼400 kDa membrane protein (lane 1), which is the approximate predicted molecular mass of full length CSMD1. Control blots performed with preimmune serum show no protein bands (lane 2). Detection of CSMD1 protein in neuronal growth cones by Western immunoblotting. Neuronal growth cone particles prepared from E17 rat brains were boiled in nonreducing SDS sample buffer and subjected to SDS-PAGE on 3–8% Tris-Acetate gels. Proteins were transferred to nitrocellulose and CSMD1 was detected using rabbit anti-rat rsCSMD1 polyclonal Ab followed by HRP-labeled goat anti-rabbit IgG and ECL (lane 1). Immunoblots performed with preimmune rabbit serum followed by secondary Ab as a control showed no protein bands (lane 2). We then performed immunolabeling experiments of CSMD1 to examine the cellular distribution of the protein in cultured neurons of the developing E17 rat cerebral cortex. Neurons were double-labeled with Alexa Fluor 488-conjugated phalloidin (Fig. 9⇓B; green) to reveal F-actin and anti-CSMD1 Ab followed by Alexa Fluor 594-conjugated anti-rabbit IgG (Fig. 9⇓A; red). Images were digitally deconvolved. The images shown represent an optical plane immediately adjacent to the growth substratum. As demonstrated in Fig. 9⇓A, anti-CSMD1 Ab detected CSMD1 in the axonal growth cone and, in particular, in its filopodia. These extensions exhibit substantial overlap of CSMD1 and F-actin label (Fig. 9⇓C). In control experiments (Fig. 9⇓, D–F), neurons incubated with preimmune rabbit serum and Alexa Fluor 488-conjugated phalloidin, followed by Alexa Fluor 594-conjugated anti-rabbit IgG, show fluorescence for F-actin labeling only. Immunofluorescence also reveals CSMD1 in the neuronal cell body, including internal putative sites of synthesis and the plasma membrane (Fig. 9⇓, G–I). These observations suggest that CSMD1, after being synthesized in the soma, is transported down the axon to the growth cone and its filopodial extensions. Overall, our results indicate that CSMD1 is a plasma membrane protein of growing neurons and colocalizes with F-actin in the neuronal growth cone, especially in filopodia. Localization of CSMD1 protein in neuronal growth cones. Images are optical sections of cortical neurons obtained by digital deconvolution. Permeabilized cortical growth cones were labeled with rabbit anti-CSMD1 polyclonal Ab followed by Alexa Fluor 594-conjugated anti-rabbit IgG (A; red) and Alexa Fluor 488-conjugated phalloidin (B; green). Localization of CSMD1 with F-actin is shown from the merger of the two single-channel images (C; overlap appears yellow). Immunofluorescence performed with preimmune rabbit serum followed by Alexa Fluor 594-conjugated anti-rabbit IgG (D) and Alexa Fluor 488-conjugated phalloidin (E) was used as a control. Overlap of the two images shows only F-actin staining (F) indicating that the anti-CSMD1 Ab was specific. Expression of CSMD1 was also detectable in the neuronal cell body (G). Both the plasma membrane and internal cellular sites were labeled. Phalloidin staining of F-actin is shown in H. Partial overlap with CSMD1 is evident in the merged image (I). Calibration, 10 μm. In this study, we describe the identification and in vitro functional activity of a novel multiple domain complement regulatory protein discovered in the rat. This protein is the homolog of the human gene of unknown function recently published as the CSMD1 gene (22). The rat CSMD1 transcript encodes a protein containing 14 N-terminal CUB domains that are separated from each other by SCRs followed by 15 C-terminal RCA-like SCR domains, making this the first SCR-containing complement inhibitor described to date with a multiple domain structure. A recombinant soluble construct of CSMD1 containing 2 C-terminal CUB-SCR repeats and 12 RCA-like SCRs exhibited the ability to inhibit in vitro classical complement pathway mediated C3 deposition on Ab-sensitized K562 cells and hemolysis of sheep erythrocytes. However, the rCSMD1 protein did not exhibit the ability to inhibit C3 deposition on alternative pathway activators, zymosan, and rabbit erythrocytes, suggesting that CSMD1 specifically regulates the classical pathway C3 convertase. The 15 SCR repeats of the CSMD1 protein share homologies with CR and regulatory proteins of the RCA family. The RCA proteins exhibit common structure/function relationships in that they are comprised of SCR domains and interact with C3/C4 activation fragments. This suggests that the observed inhibitory activity of our rsCSMD1 construct is provided by its RCA-like SCR repeats. However, the CSMD1 protein also shares homologies with other proteins by virtue of its 14 CUB-SCR repeats. Proteins that contain a CUB and SCR domain linked together have been identified in only a small number of proteins that include complement component subunits C1r and C1s, and MASPs (23, 26, 27). These proteins are a class of serine proteases that interact with and cleave C4 and C2 to activate the classical complement C3 convertase (28, 29). Thus, the inhibitory activity of our rsCSMD1 protein may be provided in part by the CUB-SCR region that may interact with or competitively inhibit C4 and/or C2 thereby preventing formation of the classical pathway C3 convertase. Further studies will be necessary to determine the exact structure/function relationship and mechanisms of inhibition. Given the large extracellular region of the entire CSMD1 protein and a cytoplasmic tail with a potential tyrosine phosphorylation site, one could predict that CSMD1 serves as a receptor or coreceptor for some unknown ligand(s) and is involved in signal transduction mechanisms. Coprecipitation and cross-linking studies on primary cells using anti-CSMD1 Abs may help to ascertain the natural ligands, coreceptors, and tyrosine kinases of CSMD1. Furthermore, expression of CSMD1 as a transmembrane protein will help in examining the ability for it to serve as a potential complement receptor and to further characterize CSMD1 complement inhibitory activity as a full-length protein. Communication between cells during development requires a network of defined interactions combining structurally and functionally independent domains that are sometimes the only link between otherwise distinct proteins. Many developmentally regulated proteins contain CUB domains such as bone morphogenetic protein (30), a mammalian splice variant of Drosophila tolloid protein that plays important roles in cartilage and bone formation (31), and neuropilin (32), a semaphorin coreceptor that functions in neuronal growth cones during the formation of neuronal circuits (33, 34). Indeed, analysis of CSMD1 expression by mRNA in situ hybridization on E15 mouse and E17 rat embryos indicates that CSMD1 is developmentally regulated and highly expressed in neurons of the developing CNS and DRG. It is of particular interest that CSMD1 expression is low in brain regions exhibiting high levels of cell proliferation. In contrast, it is very high in regions of neuronal differentiation and outgrowth, and it remains high in the adult in areas of great neuronal plasticity, such as the cerebral cortex and especially, the hippocampus. This pattern is consistent with a protein expressed in growing and sprouting axons. Indeed, Western blot of a fraction highly enriched in axonal growth cones shows a high level of CSMD1 protein. 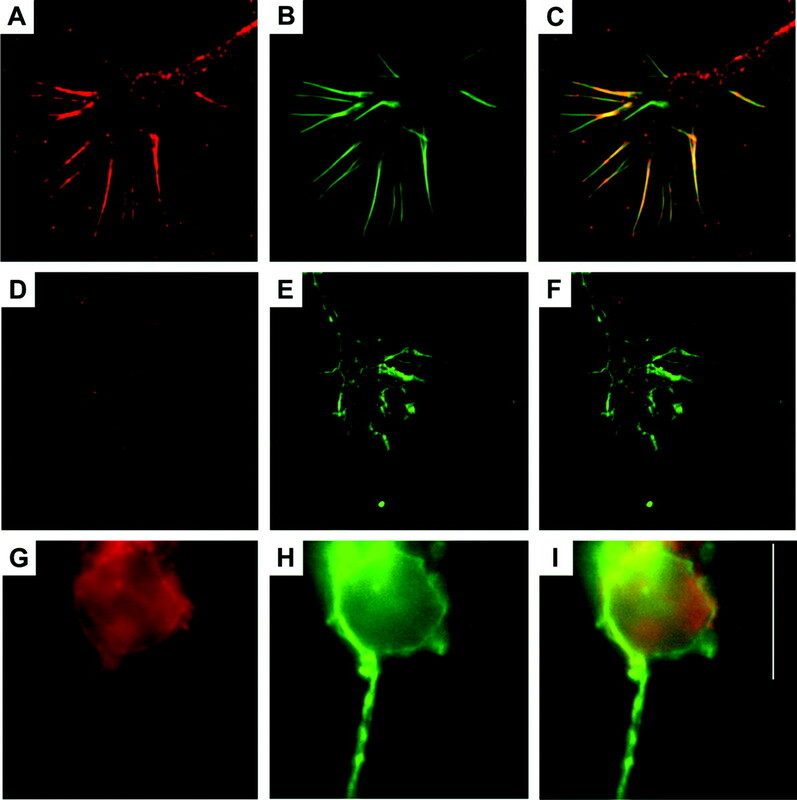 This finding is confirmed by immunofluorescence of cultured fetal cortical neurons, which indicates that CSMD1 is strongly expressed in nerve growth cones, especially in their filopodia. Thus, CSMD1, like neuropilin and other neuronal growth cone proteins, may be involved in mechanisms of signal transduction, substrate adhesion, and/or motility that help guide axons toward their synaptic targets during development. The complement inhibitory activity of CSMD1 also may serve to protect fetal growth cones from complement attack thereby allowing them to reach their targets to make appropriate linkages between neurons. The importance of fetal inhibitors of complement activation in development has been demonstrated in studies using mouse embryos deficient in Crry (35). In these studies, gene-targeted Crry−/− embryos have increased deposition of C3 activation fragments and show signs of growth retardation before they die within 15 days of gestation. However, when the Crry+/− parents are intercrossed with C3−/− mice to generate C3−/−, Crry−/− embryos, there is complete rescue of the lethal phenotype, and C3−/−, Crry−/− pups are born at a normal Mendelian frequency. Thus, fetal membrane-bound complement regulators may provide a mechanism of fetomaternal tolerance during development by protecting the embryo from spontaneous complement activation (35). However, no studies have been performed demonstrating whether complement inhibitor or receptor proteins of the CNS serve neural protective roles during development. Indeed, examination of neuronal growth cones and complement activation fragments on developing neurons of knockout mice deficient in CSMD1 will greatly further our understanding of the biochemical role of this very large protein. Several studies have shown evidence of enhanced complement activation in the brains of patients with Alzheimer’s disease (AD) despite evidence of an intact blood-brain barrier indicating that complement proteins are produced locally (36, 37, 38). Indeed, several lines of evidence indicate that astrocytes are a major source of brain complement proteins (39, 40). Blocking complement activation in experimental models of multiple sclerosis ameliorates inflammation and demyelination, providing evidence of the importance of complement in oligodendrocyte/myelin loss (41, 42). In addition, activation of complement on fibrillar β-amyloid plaques in AD suggests that complement-mediated killing of neurons contributes to neurodegeneration (43, 44). The present data show that CSMD1 is highly expressed in neurons of the adult rat hippocampus and cerebral cortex, two parts of the brain that exhibit a high level of plasticity and are affected in AD. We did not observe expression of CSMD1 mRNA on myelinated fiber tracts of the corpus callosum suggesting that oligodendrocytes do not synthesize CSMD1 under normal circumstances. Examination of CSMD1 expression profiles of the CNS in experimental models of inflammation and neurodegeneration may help to ascertain the biological role of CSMD1 in vivo. In addition to the CNS, the present mRNA in situ hybridization data indicates that CSMD1 is also expressed in areas of regenerative growth including epithelial cells of the gastrointestinal system, skin, and mammary ducts albeit at lower levels. Deletions within chromosome band 8p23 that overlap or map very close to one another have been reported for head and neck squamous epithelial cell carcinomas (45) in addition to cancers of the liver (46), bladder (47), and prostate (48). Within this locus lies a single gene that encodes the human CSMD1 (22). Two other genes, CSMD2 and CSMD3, have also been discovered with great structural similarity to CSMD1 (49, 50). All three genes encode proteins containing 14 CUB domains, each separated from the next by a single SCR domain, followed by a tandem array of repeating SCR domains, a transmembrane domain, and a short cytoplasmic tail. The great similarity between CSMD genes begs the question of whether CSMD2 and CSMD3 proteins are also likely to inhibit complement activation. Further analysis of the proteins expressed by CSMD genes and examination of these genes in animal models will be necessary to elucidate the functional roles that each gene plays in development and disease. Amgen employs G. S. Elliott, H. Chute, T. Horan, S. Foster, S. Scully, and A. A. Welcher, all of whom have stock and equity interests in the gene and its product(s) published in this article. Amgen also possesses a patent on the gene, which does not include any members of the University of Colorado Health Sciences Center. ↵1 This work was supported by National Institutes of Health Grants R01 AI31105 (to V.M.H. ), R01 NS041029 (to K.H.P. ), and by collaboration from Amgen. ↵3 Abbreviations used in this paper: RCA, regulator of complement activation; CR, complement receptor; SCR, short consensus repeat; CSMD1, CUB-sushi multiple domain 1; EST, expressed sequence tag; rs, recombinant soluble; PSG, penicillin/streptomycin/glutamine; EA, Ab-sensitized sheep erythrocyte; AD, Alzheimer’s disease; MASP, mannose-binding lectin-associated serine protease. Lachmann, P. J., N. C. Hughes-Jones. 1984. Initiation of complement activation. Springer Semin. Immunopathol. 7: 143-162. Gotze, O., H. J. Muller-Eberhard. 1976. The alternative pathway of complement activation. Adv. Immunol. 24: 1-35. Muller-Eberhard, H. J.. 1986. The membrane attack complex of complement. Annu. Rev. Immunol. 4: 503-528. Hourcade, D., V. M. Holers, J. P. Atkinson. 1989. The regulators of complement activation (RCA) gene cluster. Adv. Immunol. 45: 381-416. Ross, G. D., M. E. Medof. 1985. Membrane complement receptors specific for bound fragments of C3. Adv. Immunol. 37: 217-267. Fearon, D. T.. 1980. Identification of the membrane glycoprotein that is the C3b receptor of the human erythrocyte, polymorphonuclear leukocyte, B lymphocyte, and monocyte. J. Exp. Med. 152: 20-30. Schifferli, J. A., Y. C. Ng, D. K. Peters. 1986. The role of complement and its receptor in the elimination of immune complexes. N. Engl. J. Med. 315: 488-495. Iida, K., V. Nussenzweig. 1981. Complement receptor is an inhibitor of the complement cascade. J. Exp. Med. 153: 1138-1150. Weis, J. J., T. F. Tedder, D. T. Fearon. 1984. Identification of a 145,000 Mr membrane protein as the C3d receptor (CR2) of human B lymphocytes. Proc. Natl. Acad. Sci. USA 81: 881-885. Fingeroth, J. D., J. J. Weis, T. F. Tedder, J. L. Strominger, P. A. Biro, D. T. Fearon. 1984. Epstein-Barr virus receptor of human B lymphocytes is the C3d receptor CR2. Proc. Natl. Acad. Sci. USA 81: 4510-4514. Nemerow, G. R., R. Wolfert, M. E. McNaughton, N. R. Cooper. 1985. Identification and characterization of the Epstein-Barr virus receptor on human B lymphocytes and its relationship to the C3d complement receptor (CR2). J. Virol. 55: 347-351. Wiersma, E. J., T. Kinoshita, B. Heyman. 1991. Inhibition of immunological memory and T-independent humoral responses by monoclonal antibodies specific for murine complement receptors. Eur. J. Immunol. 21: 2501-2506. Thyphronitis, G., T. Kinoshita, K. Inoue, J. E. Schweinle, G. C. Tsokos, E. S. Metcalf, F. D. Finkelman, J. E. Balow. 1991. Modulation of mouse complement receptors 1 and 2 suppresses antibody responses in vivo. J. Immunol. 147: 224-230. Molina, H., V. M. Holers, B. Li, Y. Fung, S. Mariathasan, J. Goellner, J. Strauss-Schoenberger, R. W. Karr, D. D. Chaplin. 1996. Markedly impaired humoral immune response in mice deficient in complement receptors 1 and 2. Proc. Natl. Acad. Sci. USA 93: 3357-3361. Croix, D. A., J. M. Ahearn, A. M. Rosengard, S. Han, G. Kelsoe, M. Ma, M. C. Carroll. 1996. Antibody response to a T-dependent antigen requires B cell expression of complement receptors. J. Exp. Med. 183: 1857-1864. Barrington, R. A., O. Pozdnyakova, M. R. Zafari, C. D. Benjamin, M. C. Carroll. 2002. B lymphocyte memory: role of stromal cell complement and FcγRIIB receptors. J. Exp. Med. 196: 1189-1199. Kirkitadze, M. D., P. N. Barlow. 2001. Structure and flexibility of the multiple domain proteins that regulate complement activation. Immunol. Rev. 180: 146-161. Molina, H., W. Wong, T. Kinoshita, C. Brenner, S. Foley, V. M. Holers. 1992. Distinct receptor and regulatory properties of recombinant mouse complement receptor 1 (CR1) and Crry, the two genetic homologues of human CR1. J. Exp. Med. 175: 121-129. Foley, S., B. Li, M. Dehoff, H. Molina, V. M. Holers. 1993. Mouse Crry/p65 is a regulator of the alternative pathway of complement activation. Eur. J. Immunol. 23: 1381-1384. Platts-Mills, T. A., K. Ishizaka. 1974. Activation of the alternate pathway of human complements by rabbit cells. J. Immunol. 113: 348-358. Pfenninger, K. H., L. Ellis, M. P. Johnson, L. B. Friedman, S. Somlo. 1983. 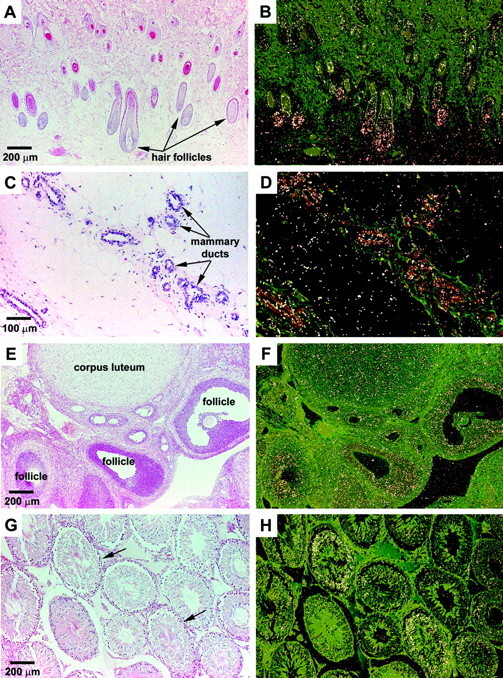 Nerve growth cones isolated from fetal rat brain: subcellular fractionation and characterization. Cell 35: 573-584. Sun, P. C., R. Uppaluri, A. P. Schmidt, M. E. Pashia, E. C. Quant, J. B. Sunwoo, S. M. Gollin, S. B. Scholnick. 2001. Transcript map of the 8p23 putative tumor suppressor region. Genomics 75: 17-25. Bork, P., G. Beckmann. 1993. The CUB domain: a widespread module in developmentally regulated proteins. J. Mol. Biol. 231: 539-545. Kalli, K. R., P. H. Hsu, T. J. Bartow, J. M. Ahearn, A. K. Matsumoto, L. B. Klickstein, D. T. Fearon. 1991. Mapping of the C3b-binding site of CR1 and construction of a (CR1)2-F(ab′)2 chimeric complement inhibitor. J. Exp. Med. 174: 1451-1460. He, C., J. J. Alexander, A. Lim, R. J. Quigg. 1997. Production of the rat complement regulator, Crry, as an active soluble protein in Pichia pastoris. Arch. Biochem. Biophys. 341: 347-352. Takayama, Y., F. Takada, A. Takahashi, M. Kawakami. 1994. A 100-kDa protein in the C4-activating component of Ra-reactive factor is a new serine protease having module organization similar to C1r and C1s. J. Immunol. 152: 2308-2316. Thiel, S., T. Vorup-Jensen, C. M. Stover, W. Schwaeble, S. B. Laursen, K. Poulsen, A. C. Willis, P. Eggleton, S. Hansen, U. Holmskov, et al 1997. A second serine protease associated with mannan-binding lectin that activates complement. Nature 386: 506-510. Vorup-Jensen, T., S. V. Petersen, A. G. Hansen, K. Poulsen, W. Schwaeble, R. B. Sim, K. B. Reid, S. J. Davis, S. Thiel, J. C. Jensenius. 2000. Distinct pathways of mannan-binding lectin (MBL)- and C1-complex autoactivation revealed by reconstitution of MBL with recombinant MBL-associated serine protease-2. J. Immunol. 165: 2093-2100. Matsushita, M., S. Thiel, J. C. Jensenius, I. Terai, T. Fujita. 2000. Proteolytic activities of two types of mannose-binding lectin-associated serine protease. J. Immunol. 165: 2637-2642. Li, S. W., A. L. Sieron, A. Fertala, Y. Hojima, W. V. Arnold, D. J. Prockop. 1996. The C-proteinase that processes procollagens to fibrillar collagens is identical to the protein previously identified as bone morphogenic protein-1. Proc. Natl. Acad. Sci. USA 93: 5127-5130. Scott, I. C., I. L. Blitz, W. N. Pappano, Y. Imamura, T. G. Clark, B. M. Steiglitz, C. L. Thomas, S. A. Maas, K. Takahara, K. W. Cho, D. S. Greenspan. 1999. Mammalian BMP-1/Tolloid-related metalloproteinases, including novel family member mammalian Tolloid-like 2, have differential enzymatic activities and distributions of expression relevant to patterning and skeletogenesis. Dev. Biol. 213: 283-300. Takagi, S., T. Hirata, K. Agata, M. Mochii, G. Eguchi, H. Fujisawa. 1991. The A5 antigen, a candidate for the neuronal recognition molecule, has homologies to complement components and coagulation factors. Neuron 7: 295-307. Masuda, T., H. Tsuji, M. Taniguchi, T. Yagi, M. Tessier-Lavigne, H. Fujisawa, N. Okado, T. Shiga. 2003. Differential non-target-derived repulsive signals play a critical role in shaping initial axonal growth of dorsal root ganglion neurons. Dev. Biol. 254: 289-302. Masuda, T., F. Fukamauchi, Y. Takeda, H. Fujisawa, K. Watanabe, N. Okado, T. Shiga. 2004. Developmental regulation of notochord-derived repulsion for dorsal root ganglion axons. Mol. Cell. Neurosci. 25: 217-227. Xu, C., D. Mao, V. M. Holers, B. Palanca, A. M. Cheng, H. Molina. 2000. A critical role for murine complement regulator crry in fetomaternal tolerance. Science 287: 498-501. Afagh, A., B. J. Cummings, D. H. Cribbs, C. W. Cotman, A. J. Tenner. 1996. Localization and cell association of C1q in Alzheimer’s disease brain. Exp. Neurol. 138: 22-32. Terai, K., D. G. Walker, E. G. McGeer, P. L. McGeer. 1997. Neurons express proteins of the classical complement pathway in Alzheimer disease. Brain Res. 769: 385-390. Yasojima, K., C. Schwab, E. G. McGeer, P. L. McGeer. 1999. Up-regulated production and activation of the complement system in Alzheimer’s disease brain. Am. J. Pathol. 154: 927-936. Gasque, P., M. Fontaine, B. P. Morgan. 1995. Complement expression in human brain: biosynthesis of terminal pathway components and regulators in human glial cells and cell lines. J. Immunol. 154: 4726-4733. Morgan, B. P., P. Gasque. 1996. Expression of complement in the brain: role in health and disease. Immunol. Today 17: 461-466. Piddlesden, S. J., M. K. Storch, M. Hibbs, A. M. Freeman, H. Lassmann, B. P. Morgan. 1994. Soluble recombinant complement receptor 1 inhibits inflammation and demyelination in antibody-mediated demyelinating experimental allergic encephalomyelitis. J. Immunol. 152: 5477-5484. Davoust, N., S. Nataf, R. Reiman, M. V. Holers, I. L. Campbell, S. R. Barnum. 1999. Central nervous system-targeted expression of the complement inhibitor sCrry prevents experimental allergic encephalomyelitis. J. Immunol. 163: 6551-6556. Rogers, J., N. R. Cooper, S. Webster, J. Schultz, P. L. McGeer, S. D. Styren, W. H. Civin, L. Brachova, B. Bradt, P. Ward, et al 1992. Complement activation by β-amyloid in Alzheimer disease. Proc. Natl. Acad. Sci. USA 89: 10016-10020. Jiang, H., D. Burdick, C.G. Glabe, C.W. Cotman, A.J. Tenner. 1994. β-Amyloid activates complement by binding to a specific region of the collagen-like domain of the C1q A chain. J. Immunol. 152: 5050-5059. Ishwad, C. S., M. Shuster, U. Bockmuhl, N. Thakker, P. Shah, C. Toomes, M. Dixon, R.E. Ferrell, S.M. Gollin. 1999. Frequent allelic loss and homozygous deletion in chromosome band 8p23 in oral cancer. Int. J. Cancer 80: 25-31. Pineau, P., H. Nagai, S. Prigent, Y. Wei, G. Gyapay, J. Weissenbach, P. Tiollais, M.A. Buendia, A. Dejean. 1999. Identification of three distinct regions of allelic deletions on the short arm of chromosome 8 in hepatocellular carcinoma. Oncogene 18: 3127-3134. Muscheck, M., F. Sukosd, T. Pesti, G. Kovacs. 2000. High density deletion mapping of bladder cancer localizes the putative tumor suppressor gene between loci D8S504 and D8S264 at chromosome 8p23.3. Lab Invest. 80: 1089-1093. Washburn, J. G., K. J. Wojno, J. Dey, I. J. Powell, J. A. Macoska. 2000. 8pter-p23 deletion is associated with racial differences in prostate cancer outcome. Clin. Cancer Res. 6: 4647-4652. Lau, W. L., S. B. Scholnick. 2003. Identification of two new members of the CSMD gene family small star, filled. Genomics 82: 412-415. Shimizu, A., S. Asakawa, T. Sasaki, S. Yamazaki, H. Yamagata, J. Kudoh, S. Minoshima, I. Kondo, N. Shimizu. 2003. A novel giant gene CSMD3 encoding a protein with CUB and sushi multiple domains: a candidate gene for benign adult familial myoclonic epilepsy on human chromosome 8q23.3-q24.1. Biochem. Biophys. Res. Commun. 309: 143-154.